Digitalization and its manifestations accompany us daily in the world of business. In its present form, digitalization has become an innovative, global and cross-sector challenge. Almost all sectors are affected by disruptive digital Trends, which have far-reaching consequences for the industry and services sector. Big data & analytics, artificial intelligence, augmented & virtual reality, cloud computing or 3D printing are just some of the themes which are the focus of increased attention and which challenge existing business models. It is not only the case that new and agile competitors enter the competitive environment, but the boundaries between industries are increasingly disappearing. For this reason, the rules of existing value added structures are being written anew. The digital transformation is, thus, no longer a purely technological issue, it is rather the case that strategy and change management aspects now take center stage. We understand digital transformation as the intelligent combination of digital content to process, product and service innovations. As part of this change process, organizations wonder what the management of digitalization encompasses. A comprehensive perspective on supply and value chain, product and finance flows as well as on internal and external interfaces to various stakeholder groups is essential. 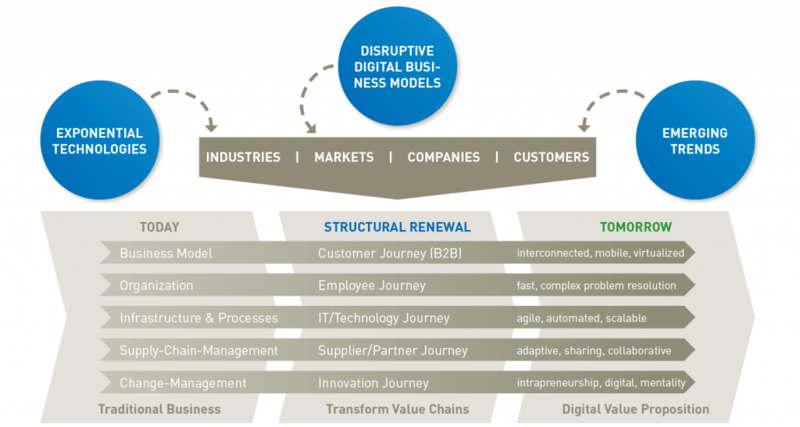 An integrative view is the basis for a strategic understanding and to successfully drive digital transformation. When supporting organizations in addressing the digital challenge, we follow four building blocks: After understanding the digital change, the focus is on the analysis of sector-related impacts of digitalization. 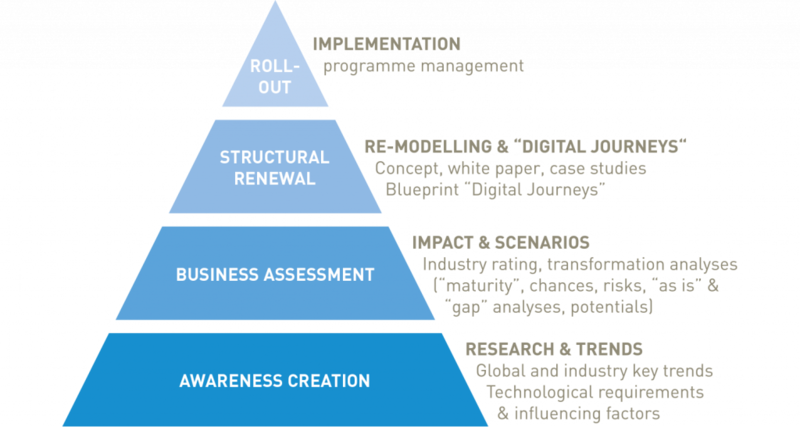 The generated information culminate in the development of appropriate strategies and practices for cross-organizational digital transformation. Each project differs in various ways from another and therefore needs individual planning. For this reason and depending on the project’s content and scope, we select a suited project team which can consist of students, lecturers and professors or also external consultants. The team works closely together with the client to develop a goal oriented and professional solution. 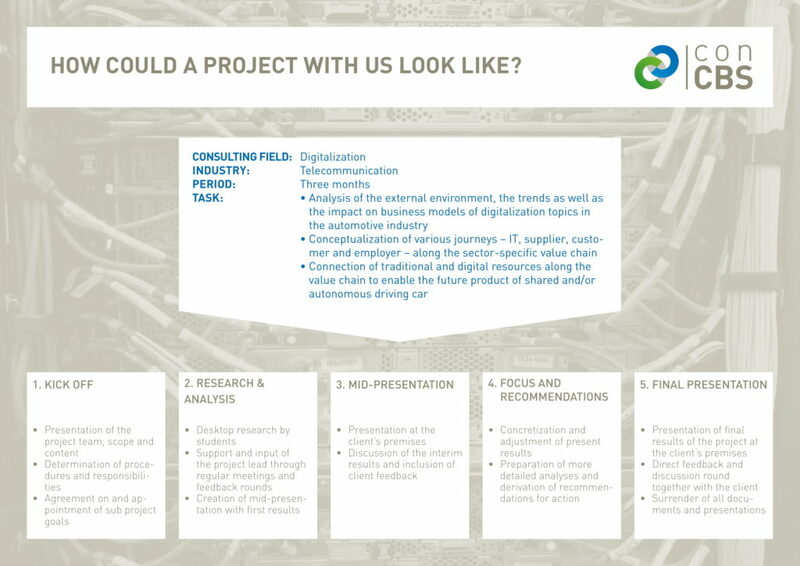 How a project could look like and which general steps it contains will be shown in our one-pager “digitalization”.